Informal workers are integral to Dakar’s urban economy. Everyday in Senegal’s capital city, vendors in the historic Sandaga market provide low-cost goods to city residents, laundresses offer cleaning services on street corners, and waste pickers take recyclable materials out of the country’s largest dump, Mbeubeuss. Informal workers make up the majority of Dakar’s workforce. Data from 2001-03 showed informal employment accounted for 80 per cent of total employment in the city. In 2017, WIEGO chose Dakar as a Focal City--an approach that intensifies activities in a city. WIEGO's work supports membership-based organizations (MBOs) in their efforts to improve outcomes for urban informal workers in many occupational sectors. Focal Cities build the capacity of informal worker leaders and their organizations, and foster dialogue between informal workers and municipal authorities. In Dakar, WIEGO has been expanding the scope of activities as MBO partners gain strength and connect across sectors. The initial phase of work focused on providing accompaniment and technical support to groups of informal workers at different stages of organization. Ongoing capacity-building with workers in areas such as: collective bargaining, governance, regulatory and legal frameworks and social protection. WIEGO works with MBOs of street and market vendors, fish mongers, taxi drivers, laundresses, domestic workers, women producers, food vendors, carpenters, and waste pickers. Several membership-based organizations (MBOs) of informal workers in Dakar have formed a consultative council for dialogue and coordinated action. FC Dakar consults with the council, as well as with individual MBOs, in planning and implementing its work in the city. FC Dakar supports BokkDiom, a long-standing association of waste pickers at the Mbeubeuss dump, in strengthening their internal organization. In 2018 it was revealed that Mbeubeuss will be closed and a sanitary landfill will be built in its place. WIEGO plans to support the efforts of BokkDiom to produce research about the waste pickers at Mbeubeuss and to advocate for their inclusion in the dump re-structuring process. See WIEGO’s Position on Dump Closures. Health-Related Practices and Perceptions Among Waste Pickers: The Case of Mbeubeuss Waste Dump in Senegal - This dissertation by Marine Vasina analyzes the situation of waste pickers in Mbeubeuss and their perceptions about their health, as well as the difficulties they face in accessing health care. 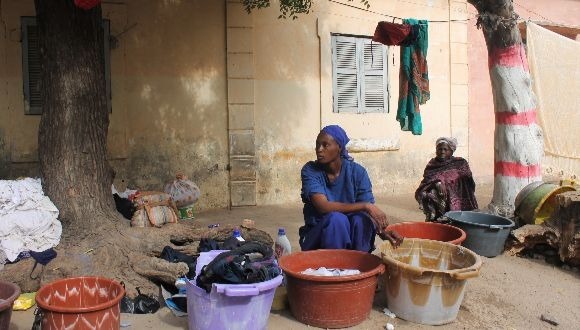 Laundresses are one of the most vulnerable groups of informal workers in Dakar: their tasks are physically difficult, they are hired on a daily basis and may have no source of earnings during periods when there is no demand for their services. They most often work in the street due to a lack of space in their clients’ houses; as a result they run a constant risk of eviction. Faced with a lack of child care options, most laundresses must bring their children to work with them. Children either stay on their back while they clean, bend, scrub, wash, twist and dry cloths – which increases their effort and the risk for injuries for both the laundresses and the children – or stay next to them in streets that are often crowded and dangerous. Over the first year of FC Dakar work, multiple exploration visits have been conducted to meet laundresses in the city, learn about the challenges they face, and support organizing efforts started by a local women’s rights organization, AFEME (Association des Femmes de la Médina). In early 2018, the laundresses decided to form a union, and FC Dakar plans to support their efforts to engage with local government around health and child care, in addition to other priorities. FC Dakar works to strengthen street vendor MBOs in Dakar to defend their right to public space in multiple ways. In March 2018, FC Dakar facilitated a consultation between street vendor organizations and public officials to discuss inclusive management of public space in the context of the recent decentralization act in Senegal. Also in 2018, FC Dakar plans to collaborate with WIEGO’s Law Programme to implement a series of activities relating to administrative law – including an analysis of the legal framework in Dakar and rights awareness trainings with workers. In addition to activities oriented towards supporting workers in defending their rights, FC Dakar also plans to work with lawyers to support them in better understanding the realities of informal workers through exposure dialogues. Eventually FC Dakar would like to facilitate the formation of an allied lawyers network that would provide advice and guidance to MBOs.